I finished this landscape oil painting commission on February this year, but I hadn’t got time to write a line about this piece of fine art. 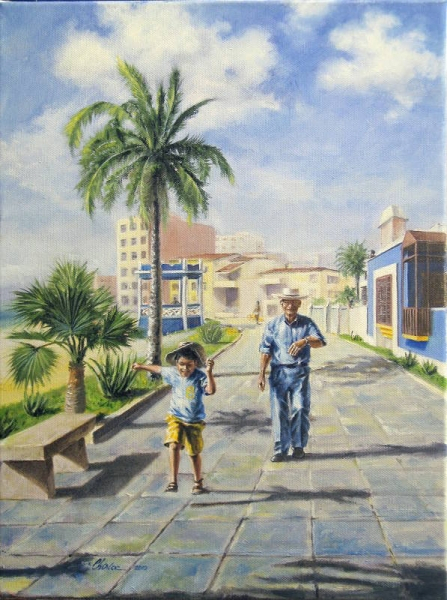 So this commissioned realist landscape depicts a beach street on a Peru resort at the Pacific ocean. The commissioner have had some very specific requirements about the painting details as characters of the composition, the specific buildings to show up on the beach-scape painting ans so on. In order to complete this oil painting commission, the commissioner sent to me several pictures of the requested details of painting composition. I’ve had to combine several photos in order to get the commission ready. It was a very challenging task but in the end it came up as a nice experience and I’m sure that it will help me a lot on future similar commissions. All in all, I think it is a beautiful painting.